“Phey Yew Kok was facing charges of Criminal Breach of Trust when he absconded while on bail in 1980. He has now turned himself in and returned to Singapore. Like many Singaporeans at the time I was mystified as to how Phey Yew Kok was able to flee before his case. Surely the prosecution had applied for his passport to be impounded as a condition of his bail? And once he had absconded why were the authorities not able to track him down and apply for his extradition? These were the days long before the Mas Selamat escape so it was difficult to believe that Singapore’s authorities could be quite so incompetent. Like Hitler or Osama Bin Laden, there were many reports of sightings of Phey around the world over the years. For years he was rumoured to be living openly in Taiwan. The suspicion grew that, for whatever reasons, Lee Kuan Yew, who was Prime Minister at the time, and the PAP Government did not want him back. Mr J.B. Jeyaretnam asked the Prime Minister if he will recommend to the President the appointment of a Commission with all necessary terms of reference to inquire fully into the loss of monies belonging to members of Trade Unions between the years 1975 and 1979 and to report in as full a manner as is possible in all the circumstances inter alia on (i) the total of all monies lost; (ii) the manner in which or how the monies were taken or lost; (iii) whether all recognized accounting practices and audit procedures had been followed in the keeping of the accounts; (iv) whether any officers in the member Trade Unions or the National Trades Union Congress should be held accountable for the loss/defalcation because of any failure on their part to take corrective measures to prevent any loss of monies and if so what action should be taken against them; and (v) the circumstances in which the former President of the N.T.U.C. Mr Phey Yew Kok was enabled to leave the country after he had been charged in the courts. The Prime Minister (LKY): Mr Speaker, Sir, I cannot recommend to the President the approval of a Commission to inquire into the matters set out in the question. It is a long question, with five limbs. They cover the six charges standing against Phey Yew Kok in the Criminal District Court – four for criminal breach of trust and two for contravention of the Trade Unions Act. There is a warrant out for his arrest for not answering to bail. I find it difficult to believe that as a lawyer, the Member for Anson is ignorant of the legal improprieties implicit in his suggestion that a Commission of Inquiry to investigate matters which, inter alia, must form part of the evidence on which these charges will rest. As long as there are reasonable prospects of bringing Phey Yew Kok to trial, nothing should be done which can be said to jeopardise the process of law. The Member for Anson is inviting me to investigate the facts, or to appoint a Commission to investigate the facts, of a criminal case which is sub judice when, in his own civil suit, pending on appeal to the Privy Council, he took immediate objection to a completely neutral reference I made in this House to the implications of the outcome for him, without touching on the merits of his appeal. However, not to be the Government’s own legal officer, I asked for the opinion of the Attorney-General. In a written opinion, he has advised against the appointment of a Commission of Inquiry. I have made copies (Cols. 465 – 472) and handed them to the Clerk of Parliament for circulation to Honourable Members. Notwithstanding this, I can state that investigations made by the CPIB disclose that altogether $698,862.68 of monies belonging to SILO, PIEU and the NTUC Travel Services (Pte) Ltd, are unaccounted for. These investigations are not closed. I must add that there were no allegations, nor is there any evidence, of missing or unaccounted funds in the NTUC. There were CBT offences committed on monies belonging to the NTUC Travel Services (Pte) Ltd. This is a private limited company, totally separate from the NTUC. As monies misappropriated have been traced and found to have been used as part of the purchase price of a house at 53B Lorong Ong Lye, now in the name of Madam Wong Chui Ping (Mrs Phey Yew Kok), a caveat has been entered against this property. Briefly, no wrong-doing has been covered-up, nor has any wrong-doer been let-off, as the question has sought to imply. If the Member for Anson wants to, there can be an inquiry on whether there has been a cover-up. But the inquiry cannot cover the evidence on which the charges against Phey Yew Kok are founded. The Minister for Home Affairs will provide the answer in Question No. 10 on what happened to Phey Yew Kok. Mr J.B. Jeyaretnam (Anson): Mr Speaker, Sir, I am indebted to the Prime Minister for the lengthy statement. As I understand it, it would be contempt of court to inquire into it while proceedings are pending before a criminal court, but the trial has not begun as yet. It is, in m view, always open to the prosecution to withdraw for the moment the charge against Mr Phey Yew Kok and that he be discharged not amounting to an acquittal and then an inquiry held, and when Mr Phey Yew Kok is apprehended and brought into this country he can be freshly put on trial on those charges. Would the Prime Minister like to consider that? Mr Jeyaretnam: A discharge not amounting to an acquittal. The Prime Minister: There are two steps the Attorney-General can take – enter a nolle prosequi or withdraw the charges. Which does he propose the Attorney-General should do? Mr Jeyaretnam: Mr Speaker, Sir, I was not suggesting that there should be a nolle prosequi entered. From my own experience it has very often been the case that the Prosecution – where a witness is absent or is not available to give evidence – consent to the accused being discharged, such discharge not amounting to an acquittal, and then the case is again brought up when the witnesses are found. That is my experience in the courts. The Prime Minister: We are asked now to get the Attorney-General to withdraw the charges not amounting to an acquittal. The warrant for his arrest will then be automatically treated as lapsed, because there are no charges pending. Mr Jeyaretnam: Warrants can be applied for again on those charges immediately after that, and it often happens that warrants are applied far from the courts and issued even when persons are out of the country. Attorney-General to go into an elaborate subterfuge. In other words, the Member for Anson, in putting his question which is really to create a smear that there has been a cover-up, knew that he was suggesting something improper and had come prepared for an answer that this was being thwarted because it is sub judice, and therefore he proposes that we withdraw the charge; warrant will lapse; commission of inquiry is held, Phey Yew Kok’s trial in effect is held by the commission of inquiry; all the issues involved are prejudged; the commission reports, charges are then reintroduced; warrants for arrest are reissued. Is that what is being seriously suggested – that a government should require its Attorney-General to do because a Member of the Opposition wants to satisfy his curiosity? Mr Jeyaretnam: Mr Speaker, Sir, I was not attempting smears. I would ask the Prime Minister not to impute too readily motives to the Opposition Member. The terms of inquiry of the commission can be drafted in such a way as to exclude any inquiry as to the guilt or otherwise of Mr Phey Yew Kok. The inquiry can be directed as to how – I have set out some of the matters on which the inquiry can be conducted, and that is whether accounting and correct accounting and audit practices, procedures, had been followed and whether anybody else was aware of the manner in which these moneys were being taken from the amounts held by these unions. The Prime Minister: The commission of inquiry was supposed to have terms of reference which would cover the question set out: to report in as full a manner as possible in all the circumstances, interalia, on (i), (ii), (iii), (iv) and (v). This has been spelt out. I am suggesting to the Member that he must know that this is improper. It must cover the grounds on which the evidence against Phey Yew Kok rest, including the system by which he siphoned off the money. How can we have this elaborate deception of withdrawing the charge, allowing the warrants for arrest to lapse, have a Commission of Inquiry, find out how it was that monies were siphoned off, and then re-institute the charges? If the Member for Anson wants Mr Phey Yew Kok to have a good defence, that is exactly what he would do. He could then turn up and get the Member for Anson, or indeed any other lawyer in town, to go to court and say that a fair trial has been prejudiced. I am not a lawyer but it seems to me self-evident that there should have been a public commission of inquiry. There should also have been one in the Teh Cheang Wan case where our judiciary established the principle that even asking questions could be construed as defamatory but that is another story. Again “sub judice” rules make no sense in Singapore where LKY abolished jury trials in the 1960s. If Phey gave evidence he has the constitutional right not to answer questions that might incriminate him. Mr J.B. Jeyaretnam asked the Minister for Home Affairs whether he will outline all steps that have been taken to obtain or secure the return to this country of Mr Phey Yew Kok former President of the National Trades Union Congress to stand trial upon the charges instituted against him and on which he jumped bail. 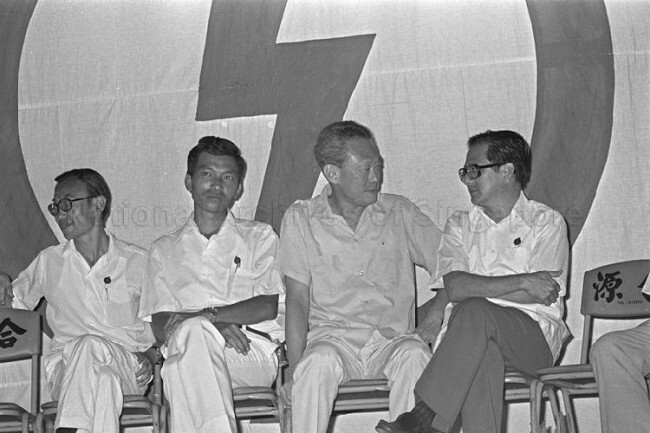 The Minister for Home Affairs (Mr Chua Sian Chin): Mr Speaker, Sir, Phey Yew Kok was charged in court on 10th December, 1979 on four counts of criminal breach of trust (CBT) and two counts under the Trade Unions Act. He was allowed bail. When the case was brought up for mention on 7th January, 1980, he failed to appear in Court. The bail of $50,000 and $45,000 respectively of the two bailors were estreated by the Court. lawyers but could not locate him. They also called on union members who were close to him to question them on his whereabouts but they could not assist. On 7th January, 1980, when he failed to appear in Court, the Police were alerted to look out for his car. On the same day the car was sighted in the car park in front of Hotel Equatorial. Subsequent investigations carried out by CPIB revealed that Phey Yew Kok had left Singapore for Kuala Lumpur by train on 31st December, 1979. From there he went to Bangkok where he disappeared. CPIB had contacted the Thai Police authorities for assistance to locate his whereabouts. However, the Thai Police authorities subsequently reported that they could not trace him. Immediately after he jumped bail, a warrant for his arrest was issued. CPIB also made an immediate appeal in the local newspapers for information on Phey Yew Kok’s whereabouts. Interpol Headquarters was alerted and it notified all Interpol countries to arrest Phey Yew Kok. Should he be arrested in a country which has an extradition treaty with Singapore, his extradition will be sought. The Immigration Department also cancelled both his International Passport and his Restricted Passport for travel to West Malaysia. All Immigration checkpoints have been told to seize his passport and refer him to CPIB if he were to pass through any checkpoint. Our overseas missions have also been informed of the cancellation of his passports and were instructed not to issue any passport to him. They are to immediately inform the Immigration Department if he tries to apply for one. When Phey Yew Kok eventually returns to Singapore, as he must if he wants to be with his wife and family again, he will have to face the charges against him. Each day he remains a fugitive, is a day of punishment, without it being considered part of the period for remission of any prison sentence he might have received. The Police had not expected him to consider it worth his while to jump bail and be a fugitive for the charges that had been brought. They made an error of judgment in not removing his International and Restricted Passports. It could well be that Phey Yew Kok made a greater error in deciding to jump bail. The question is: does he want to live as a fugitive, on the run and subject to extortion and blackmail for the rest of his miserable life? Or is it not better, like Wee Toon Boon, to face the courts, accept any punishment due, and rebuild his life? Mr Jeyaretnam: Mr Speaker, Sir, the Minister has said that it was an error of judgment in not taking away Mr Phey Yew Kok’s passport. Would the Minister say whose error of judgment it was and whether he had asked for any explanation from this man who made the error of judgment as to how he fell into this error of judgment? Mr Chua Sian Chin: Mr Speaker, Sir, as a lawyer, the Member for Anson should know that it is not as of right that you can ask for the retention of a passport of a person who has been granted bail. It is a matter for the discretion of the Court whether to allow retention of the passport, and it is not normally given. As to the specific question whether the police officer concerned has made an error of judgment, yes, he has made an error of judgment. Of course, in his opinion it was unlikely that a person of Mr Phey’s position would jump bail. It is not something which you can blame the police officer in this case. As I have said, it is not normal to ask to impound the passport of a person who is granted bail. Mr Sia Khoon Seong (Moulmein): Mr Speaker, Sir, I do not know whether my supplementary question should be directed to the Minister or to the Member for Anson, but is it not right to say that there had been others who jumped bail even when their passports had been seized? In other words, there are other means of running away from Singapore. by which a person can jump bail even without a passport. Mr Sia Khoon Seong: Mr Speaker, Sir, with the benefit of hindsight, it can now be said that there has been an error of judgment. But could I ask the Minister, or perhaps the Member for Anson, that without the benefit of hindsight, was it not quite natural for the officer to consider that it would not be necessary to impound his passport in view of the kind of offence that Phey Yew Kok was charged? My point is that Phey Yew Kok was an honourable Member of this House, and at that point of time the officer made a judgment which, I think, was quite fair. I am asking whether at that point of time that judgment was, in fact, an error of judgment. Of course, now on looking back and with the benefit of hindsight, it was an error of judgment. But who expected Phey Yew Kok to do that, and who expects any honourable Member in this House to do that? The Second Deputy Prime Minister (Foreign Affairs) (Mr S. Rajaratnam): I can think of one! Mr Chua Sian Chin: Mr Speaker, Sir, we do not go around punishing police officers for making an error of judgment. We only punish them if there is negligence on their part. I can assure the Member that there was no negligence on his part, civil or criminal negligence. Mr Jeyaretnam: Sir, is the Minister not aware that the first thing that the CPIB officers do is to impound passports of persons into whose crimes they are inquiring? I know this, Mr Speaker, from the cases that I have handled, that the first thing the CPIB do is to impound the passport. Would the Minister say whether the officer had asked for directions from the DPP or any other authority before he decided not to make an application to impound Mr Phey Yew Kok’s passport? Mr Chua Sian Chin: Mr Speaker, Sir, before I answer that question I want a clarification from the Member for Anson. What does he mean by saying that before the officer decided not to impound the passport of Phey Yew Kok, did he ask for directions from the DPP? As a lawyer, he should know that an officer must complete his investigations before he can consult the DPP. I do not know what the Member means by saying that as soon as a person appears before a CPIB officer, in the course of questioning, his passport is impounded. At that stage, how can the officer ask the DPP whether he should impound the passport? At what stage is the Member referring to? Mr Jeyaretnam: May I answer that question, Sir? Mr Speaker: Yes, Mr Jeyaretnam. Mr Jeyaretnam: The Minister talks about impounding of passports after completion of investigations. Mr Phey Yew Kok was produced in court. I should have thought that all investigations were completed by the time he was produced in court. Why was there not an application made to the court to impound his passport? And if the CPIB officer or police officer decided that no application was necessary, did he seek the directions of any superior officer, either from the Attorney-General’s Chambers or someone higher up in the police force? Because speaking from my own experience, invariably the CPIB seize passports and this had been a departure from the normal practice. Mr Rajaratnam: A point of clarification, Sir. I am not speaking from any experience. In view of the sneaky proposal that the Member put earlier to the Prime Minister that the charges against Phey Yew Kok should be dropped, is he really serious in pursuing this particular question? Mr Chua Sian Chin: Now the Member’s question is clear, and that is whether the officer did ask for directions to impound or not to impound the passport of Phey Yew Kok after he was charged in court. The answer is: yes, he did. The point is this. As I have said just now, it is not normal for the court to impound the passport of a person who has been granted bail and in their opinion, it is not necessary in view of the position of Phey Yew Kok. It may be an error of judgment but it is certainly not negligence on their part. Mr Jeyaretnam: Mr Speaker, Sir, the Minister has said that the officer did ask for directions. May we know who he asked for directions from? Mr Chua Sian Chin: He asked directions from the DPP. JBJ got the Minister to admit that the CPIB investigators were reluctant to take away Phey’s passport because of his status and connections and that furthermore when they consulted the DPP on whether to impound his passport after Phey was charged they were told it was unnecessary. 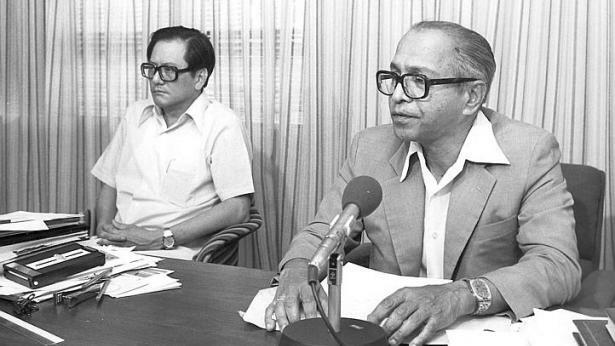 Mr J.B. Jeyaretnam asked the Acting Minister for Labour (a) whether the investigations into the loss of monies belonging to Trade Unions between the years 1975 and 1979 have now been completed; and (b) what is the total of the unions’ monies that has now been found to be missing or lost and how much of it has been recovered. The Acting Minister for Labour (Prof. S. Jayakumar): Mr Speaker, Sir, on the first part of the question, except for a case involving $1,320 which the CPIB has not been able to complete without questioning Phey Yew Kok, the CPIB has completed the investigations into the loss of money belonging to the trade unions, i.e. SILO, PIEU and the NTUC Travel Services (Pte) Limited between the years 1975 and 1979. As to the second part of the question, the total of the unions’ money lost between 1975 and 1979 is $704,173.93 or $5,311.15 more than the $698,862.68 already discovered in March 1982. Sir, the sum recovered to-date is $557,864.76. Mr Speaker: Let us have your supplementary question, please, Mr Jeyaretnam. Mr Jeyaretnam: May we know what action has been taken to recover any of these monies? We understood that Mr Phey Yew Kok or his wife have some properties. Has any action been taken to recover these sums? Prof. Jayakumar: Mr Speaker, Sir, first of all, I am indeed surprised that he himself has raised the matter of having wrongly addressed the Question to the Prime Minister. We know his insatiable desire to be equated with the Prime Minister but I thought he would be very embarrassed to find that he has directed it to the wrong Minister and that the person in charge of Labour is myself. So it is no surprise to him and to the House that the matter was redirected to the Minister for Labour. Second, Mr Speaker, Sir, I do not really see any usefulness in going into the details because the Member for Anson, quite obviously, in pursuing these tedious questions over two years has the objective of casting a slur or smear that there has been a cover-up and he has tried to create a myth, an impression, that only when he asks a Question that the Government begins to take action on this matter. So for the record, we should make it clear that long before he set foot in this Chamber and long before he espoused any interest on this subject, the Government has taken action to investigate, apprehend and prosecute the wrongdoers. And that record has to be emphasized to rebut the objective of his Question. I have already mentioned the sums recovered. The details of the processes whereby these sums are recovered are matters left to the Unions and their solicitors. I do not think that this Chamber is the proper place for me to disclose the details of the various legal steps which the Unions are taking in consultation with the solicitors. The figures speak for themselves. They have been very successful in recovering close to 80% of the sums missing or lost. The Prime Minister did mention a property in the March 1982 answer (Hansard, 3 March 1982 (Vol. 41, Col. 364) with regard to which a caveat has been lodged. The action is pending by the Unions concerning the property in question. But I am not, in this House, going to divulge the details which must be left to the Unions and which only can be divulged with the consent of the Unions concerned. Mr Jeyaretnam: Mr Speaker, Sir, I would like the Acting Minister for Labour to answer specifically to questions. Does he not realize that Mr Phey Yew Kok has been charged with embezzlement of sums of money? Has any action been taken by the unions, albeit on his advice, to proceed against properties owned by him in Singapore? Has it been done? Secondly, would the Acting Minister please tell this House whether it is intended to hold any public inquiry at all into the loss of these monies? Or is it not going to be held? It is no good saying that I am insinuating cover-ups. All I can say is that the cap fits. I am sorry about it. But you have got to answer. Prof. Jayakumar: Mr Speaker, Sir, the Member has asked two questions – whether any steps have been taken by the unions concerned to recover the monies. The answer is obvious – obviously yes, as the figures themselves demonstrate. Secondly, he has resurrected his question of a commission of inquiry, which was fully answered by the Prime Minister. And to summarize the Prime Minister’s answer, a commission of inquiry can be held if the Member’s purpose is to insinuate cover-ups or that anybody has been let off. But if the purpose is to traverse grounds and evidence with respect to the charges against Mr Phey Yew Kok, that will be sub judice and a written Opinion of the Attorney-General was circulated in this House. Mr Speaker: I am afraid it is half-past Three. The Clerk will now proceed to read the Order of the Day. Jeyaretnam asked the Minister for Home Affairs if the Police have given up all hope of finding Mr Phey Yew Kok. Dr Lee Boon Yang (for the Minister for Home Affairs): Mr Speaker, Sir, I shall answer on behalf of my Minister. I would like to inform the Member for Anson that the warrant of arrest against Phey Yew Kok is still in force and he remains on the wanted list of all the Interpol member countries. Jeyaretnam: May I ask the Minister of State that in view of the great speed and efficiency in which the Singapore Police have been able to track others who have left Singapore, there are doubts now being raised in the public mind of the efficiency of the Singapore Police when they seem unable to track down Mr Phey Yew Kok. Is he aware of that? Lee: Mr Speaker, Sir, the speed at which the Police Force has been able to trace other fugitives from justice in Singapore is, to a large extent, dependent on the good and reliable information that the Police Force has obtained in those cases. There had been cases where Interpol had provided timely information which resulted in the apprehending of these fugitives. In the case of Phey Yew Kok, unfortunately, such information has not been forthcoming. Jeyaretnam: Is the Minister of State aware of the answer that was given, I think, in the last Parliament by the then Minister for Home Affairs that this man was somewhere in a neighbouring country and I asked for this country to be named and that was not divulged? Is he also aware that this House was then told that the Police were anxiously keeping surveillance to see whether he was moving out of that country to anywhere else? Would the Minister of State tell us something more? Is that man still hiding in one of the neighbouring countries? Lee: Mr Speaker, Sir, the Member for Anson mentioned that he was informed at the last Parliament that Phey Yew Kok was still in a neighbouring country. I would like to point out to him that the House was actually informed that, as far as the Police investigation was concerned, he was traced to have left Singapore on 31st December 1979, proceeding to Kuala Lumpur, and from there on he was understood to have left for Thailand. And from there on the trail disappeared. The Police does not have any information at the present moment on the whereabouts of Phey Yew Kok. But if the Member for Anson has any information which he thinks might be relevant to the case, he is welcome to assist the Police by supplying this information so that a detailed investigation and apprehension of Phey Yew Kok can be carried out. Jeyaretnam: Will the Minister of State tell us whether the family of this man, Mr Phey Yew Kok, is still living in Singapore? Lee: Yes, the family of the man is still in Singapore. Jeyaretnam: Will the Minister tell us whether the Police are aware if the man is in contact with members of his family or have they lost all contact with him? Lee: Mr Speaker, Sir, as I have said, the Police have no knowledge of the whereabouts of this man. The Police does not know if he has been in contact with his family. Jeyaretnam: Have the Police interviewed members of the family recently? Have they seen or censored any post coming to the family from abroad? Lee: Mr Speaker, Sir, is the Member for Anson suggesting that we conduct a Police investigation on the members of the family? There has been no information as to whether he has been in contact with the family or not. Does he now propose that the Police launch a surveillance and a persecution of the family? Jeyaretnam: Mr Speaker, Sir, may I assure the Minister of State that I am not suggesting that the family should be put under third degree treatment. But is the Minister saying that the Police are averse to interviewing the family and averse to keeping watch on any correspondence received by this family from abroad because I know that is done in other cases? Lee: Mr Speaker, Sir, I am not aware of what has been done in other cases in terms of surveillance of the letters and correspondence. I do not know what the Member for Anson is suggesting. If he has any facts in regard to such surveillance, he should bring these to the House. The Police will do whatever is necessary to trace the whereabout of Phey Yew Kok. I do not think it is necessary or relevant at this point of time to inform the House of all the Police procedures in this case. Sir, the Member for Anson has a penchant for raising this case regularly. Lee: By his frequent raising of this subject, he is serving notice to the fugitive that he should make himself scarce. Then of course at the end of 1986 LKY had JBJ expelled from Parliament through a conveniently fabricated conviction by a compliant judge that the Privy Council said had been a grievous miscarriage of justice but were unable to reverse. However in 1998 JBJ, re-elected as an NCMP, returned, persistent as always, to asking the same questions that the PAP refused to answer. Mr J B Jeyaretnam asked the Minister for Home Affairs (i) whether the search for Mr Phey Yew Kok has been abandoned and (ii) what success the police have had to secure the return of the man reported to be hiding in Macau after the suicide of the late Mr Teh Cheang Wan. The Minister of State for Home Affairs (Assoc. Prof. Ho Peng Kee) (for the Minister for Home Affairs): Sir, any effort in tracking down Phey Yew Kok is now very much dependent on available intelligence on his exact whereabouts. Without this, no specific effort can be mounted. Meanwhile, he is still on the wanted list of all Interpol member countries. Also, the warrant of arrest against him is still in force. As for the question on securing the return of “the man hiding in Macau after the suicide of the late Mr Teh Cheang Wan”, can Mr Jeyaretnam give me the name of the person he is referring to so that I can answer the question? Mr Jeyaretnam: If the Minister had read the Hansard in 1987, he would have seen that the then Prime Minister did not reveal the identity, but was simply saying the man had run off to Macau and was hiding and they were trying to get him. So I am afraid I cannot give the identity. The CPIB must know. Assoc. Prof. Ho Peng Kee: I would like to assure Mr Jeyaretnam that I have read the Hansard. I wanted to make sure because the tenor of his question suggests that this person was implicated in Mr Teh’s death. Mr Jeyaretnam: That is what the then Prime Minister said. Assoc. Prof. Ho Peng Kee: In that case, I know who he is referring to. That would be Ho Yau Koon from whom Mr Teh Cheang Wan allegedly received gratification for assisting Ho to buy a piece of land. Ho Yau Koon passed away in Hong Kong in 1987. Mr Jeyaretnam: Considering that this man Phey Yew Kok has been out of the country for more than 20 years, and we hear the Minister saying that the Police has still not been able to find where he is, are we to understand that the Police are now abandoning the search because I cannot see any purpose? The second question is: are the Police aware or do they know if the wife of Mr Phey Yew Kok regularly takes trips out of Singapore or not? Assoc. Prof. Ho Peng Kee: Sir, as to the first question, I have stated just now that he is still on the wanted list of Interpol. The case is therefore still alive. As to the second question, because the case is alive, it would not be prudent to divulge information on the operation procedures of the CPIB. Mr Jeyaretnam: May I know the answer to a simple question and, that is, do the Police know that the wife goes regularly out of Singapore or not? Assoc. Prof. Ho Peng Kee: Sir, I think I have answered that question. To the PAP and Lee father and son, any attempt to find out the truth can be dismissed as a smear campaign. It was entirely legitimate for JBJ to call for a Commission of Inquiry into how deep the corruption went in the case of Phey Yew Kok, a senior figure in the PAP and close to the PM, just as it was for the case of Teh Cheang Wan. Nothing could better illustrate the need for a strong Opposition to hold the Government to account than the Phey Yew Kok saga and the lengths to which the PAP and LKY went to silence the questioner. Why was Phey allowed to retain his passport? How deep did the corruption go and how was he able to get away with it for so long? What controls are in place to prevent its recurrence? How did Phey support himself during his years of exile? Did his wife visit him? Why did he surrender himself so quickly within a month of LKY’s death? Was any deal done that he would stay out of the country while LKY was alive and was any deal done before he surrendered to the embassy in Bangkok? Despite Lee Hsien Loong saying that the court case will provide closure this seems unlikely.